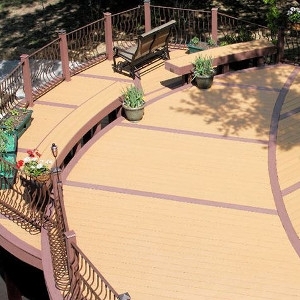 ModernView composite decking brings a modern perspective to MoistureShield's signature high performance. ModernView is produced by using a unique formulation and is protected to the core. It may be used on the ground, in the ground or in the water. The 4 vibrant colors are specially engineered to produce a clean, natural looking composite deck. The distinctive grain embossing on both sides of the board allows for easy installation with enhanced durability and the natural look of traditional wood. ModernView Decking is Affordable Luxury. Available in grooved & non-grooved.